« Boylans soda is back! Spend any time walking in LA, and you’ll understand why people don’t like to do it. Yes, the city is a sprawling metropolis – but on a micro-level, block by block basis, it is an universally inhospitable place to walk. Why is that? Prior to 1973, property owners were responsible for the upkeep of the sidewalks abutting their property. In 1973, the City of LA got a bunch of money from the federal government and decided to take on that responsibility using federal funds. The federal funds ran out in 1976. At the time, the state was in full tax revolt – Proposition 13 passed in 1978 and since then any attempt to mandate a “new” sidewalk repair law has failed miserably. Since then, the City of LA has a 30 year backlog of repairs to attend to, and no regular source of funding that is large enough to manage the situation. In 2002, in Barden v. Sacramento, the United States Court of Appeals found that a city that does not maintain it sidewalks and curb cuts is in violation of the Americans with Disabilities Act. Since that case, the City of Sacremento has been forced to drastically change the way it spends its transportation dollars: 20% of it’s Transportation Fund dollars go maintaining pedestrian rights of way. 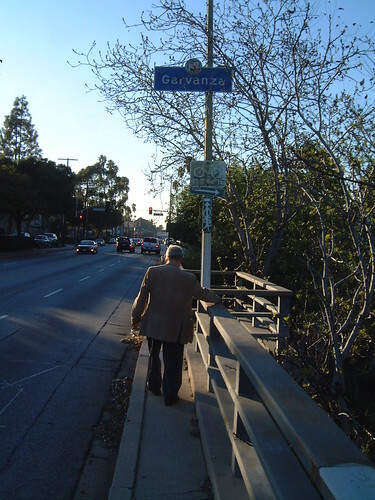 Dr. Shoup has, in “Putting Cities Back on Their Feet”, proposed that sidewalk repair be mandated at the time of sale of a piece of property – a so-called “Point-Of-Sale” program that has been used successfully in many other municipalities faced with a similar crisis of sidewalk maintenance costs. So far, his Point-Of-Sale idea has not gone very far, but a class-action lawsuit has been filed against the City of Los Angeles along the lines of Barden v Sacramento – and the City of Los Angeles is looking to settle. Whichever way the settlement goes, let’s hope that our city’s sidewalks get the attention they deserve. We do walk in LA, and we deserve to be able to do that, despite what “Missing Persons” have to say.